Greetings from Costa Rica! We have safely arrived and happily welcomed the three pieces of luggage that took an extended stay in Houston. Unpacking is a little bit like Christmas. The cabina is charming and we are settling in and working through the firsts of this trip. First night’s sleep in Costa Rican nightsong (crickets, birds, ocassional dog, portable fan). First trips to the grocery store, figuring out store layout, price differences, and Spanish names for ingredients. First taxi ride with more people than seatbelts. First morning devotions with the Hogar de Vida family. First Jillian Michaels dvd workout on a tile floor. First mispronounced Spanish words. First taste of mango picked right up off of the ground. Mmmm. . . One even rolled right down the sidewalk and up to our door yesterday. I think it was a divine appointment. The kids are doing great as we find a new rhythm for our family in this place. It is a blessing to see them take these new experiences head on. Please continue to lift us up in prayer as we learn how to do life here as Team Gnuse. 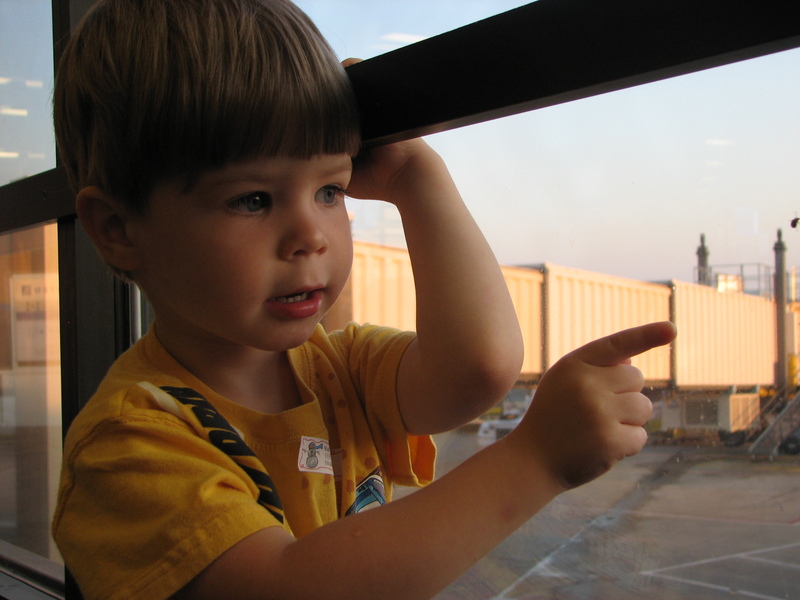 Ezekiel watching planes at the airport. 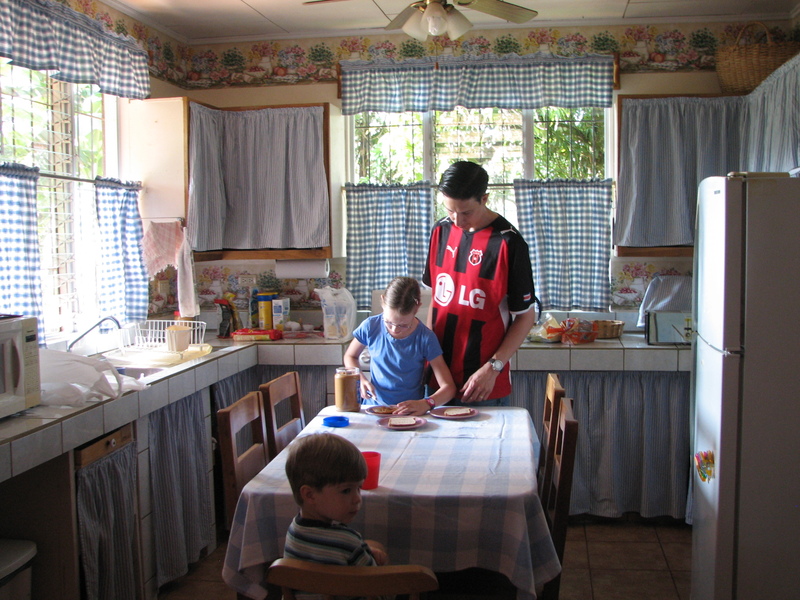 Making breakfast in our cabina. This entry was posted in Costa Rica and tagged Costa Rica, Home of Life, Spanish, unpacking. Bookmark the permalink. Awesome. ASK Team and I are praying all the while! Love the pics! Eliana is getting so big! I can almost taste the mango. Mostly jealous of the coffee. Let God be your guide and if Matt says to fast I would do it! Sending our love – your family looks right at home. Firsts are so exciting. PS I know that mango tree! Grace abundant. oh kris! i loved reading marcia’s account of reading your blog. wow. absolutely amazing god 😀 xoxoxoxo can’t wait to hear more! So glad to hear you and yours have arrived!